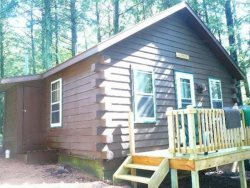 Built in 2008, this spacious 4-bedroom, 2 bath cabin is everything you're looking for! The main level features an open-concept living room/kitchen/dining area, complete with ceiling fans, in-floor radiant heat, free-standing fireplace, dishwasher and ice maker. There are also 3 bedrooms. The loft includes 2 twin beds. Outside, you can sit on the large porch/deck overlooking the water to enjoy the beauty of the Northwoods! Book today!